During a move, your household will endure many changes and stressful situations. This can affect you and your family – including your pup. Your dog can definitely get stressed when they sense the oncoming change. They may feel that you are leaving them too and it is difficult to tell them that they are not getting left behind. There are certain things you can do to help your pup cope with the process of relocating. 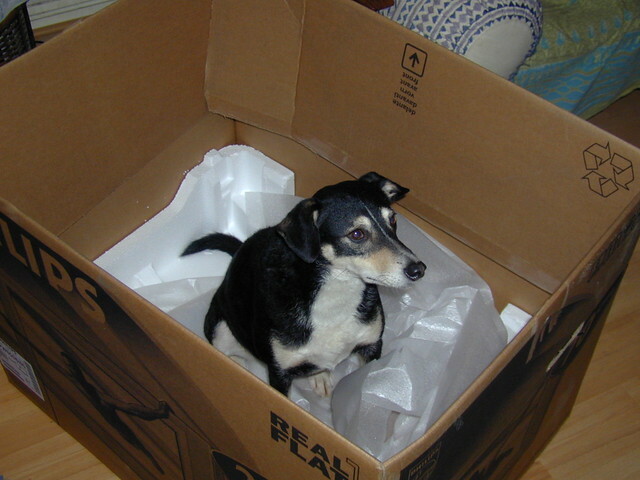 While you are packing, it is best to let your pup stay with a friend if available. Keeping them away from all the commotion will help prevent them from getting anxious. If you can’t find a puppy-sitter, you may need to find a place to isolate them like the backyard. The distractions outside may help keep their mind off of what is going on inside. If you have children, this is a good opportunity to let them all play outside so that you can get the house packed. Keeping a regular schedule will be important for this stage in the moving process. You will want to continue walking, feeding and playing with your pup as though nothing is changing. This will help them cope with the oncoming changes and reduce the fear that you may be leaving them. To prepare for traveling, it will be wise to find a suitable pet carrier. Get them used to this device by putting their familiar belongings in it. A blanket that they like to sleep in and some chew toys will create incentive to accept the device. Taking your pup on short drives will get your pup used to the motion and give you the opportunity to know if your pup has motion sickness. If this seems to be a problem, consider seeing a vet to see if they have a sedative that the pup can take for the trip. You will also need to change your pup’s tags accordingly for the new address and any shots that must be made. Planning ahead, you will need to find out about any pet laws and regulations that will be implemented in your new home. Locating dog parks and a veterinarian will be important when moving to a new residence. If your journey will require you to stay the night in hotels, you will need to call ahead and make sure these places will be pet-friendly so that your pup can get a good night’s rest as well. It is not a wise idea to leave your pup in the car overnight or worse yet actually putting them inside a moving van. It will be dangerous for your four-legged friend, and may get a bit messy. Preparing for a move can be very stressful for you, but make sure that you are considerate of your pup. Remember that you can’t directly communicate with your pup, so you will need to continuously do things to reassure them that they are coming with you. Ensuring that your travels will be safe and your new home will be puppy friendly are essential for your doggy. Keep them in mind, and keep them in your heart.